This is the fourth in a six-part series on utility business model reform provided by Rocky Mountain Institute, America's Power Plan, and Advanced Energy Economy Institute, originally published by Utility Dive. Incentives inherent in the traditional cost-of-service utility revenue model discourage utilities from investing in non-traditional solutions. This is because non-traditional solutions, such as demand management programs and distributed energy resources (DER), are normally treated as operating expenses, which are passed through to customers without earning a return. Instead, if a utility invests in a traditional "poles and wires" solution, it is given the opportunity to earn a rate of return — creating a profit motive. But it doesn't have to be this way. Con Edison's Brooklyn Queens Demand Management (BQDM) program, where the New York Public Service Commission (PSC) adopted incentives to encourage Con Edison to contract for third-party services that drive down project costs, shows one way to create a win-win-win scenario for the utility, third-party companies and customers. The BQDM program resulted from a settlement in Con Edison's 2013 rate case. Rising electricity demand in Brooklyn and Queens was identified as causing potential capacity constraints on a portion of its grid that could overload existing infrastructure and lead to reliability concerns as early as 2018. Con Edison earns an authorized rate of return on BQDM program costs. Con Edison has the potential to receive up to 100 basis points in performance incentives above its authorized rate of return on BQDM program investments: 45 basis points tied to achieving the proposed 41 MW demand reduction with alternative measures; 25 basis points tied to increasing diversity of DER in the marketplace; and 30 basis points tied to achieving a lower $/MW value than traditional investments. Con Edison proposed an additional shared savings mechanism that was rejected, in which it would receive 50% of the annual net savings, as calculated as the difference between the annual carrying cost of the original $1 billion traditional investment package and the total annual collections for the BQDM program. Con Edison ultimately revised the proposal (subsequently approved) for future non-wire alternative (NWA) projects (including in the extension to the BQDM program), allowing the utility to earn 30% of the annual net benefits. Con Edison is able to recover investments over a shorter time horizon (10 years) than it would with traditional capital investments. Accelerated depreciation allows Con Edison to write off the investment quicker and thereby increase their working capital. 17 MW of traditional capacitor and load transfer solutions. The solutions, which were expected to defer the need for the traditional infrastructure investment for at least seven years, were approved by the PSC with a $200 million budget (plus $305 million for the traditional solutions) in December 2014. See the breakdown of load relief progress through 2017 in the chart below. 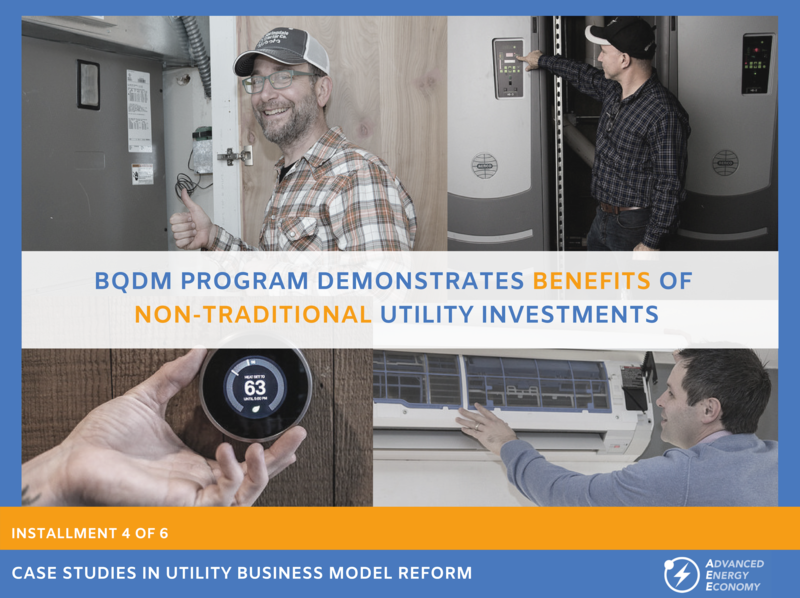 The BQDM program was proposed before New York's well-known Reforming the Energy Vision (REV) proceeding started, allowing it to act as a test bed for stakeholders to explore REV concepts. Con Edison was able to learn more about the potential for DER solutions while participating customers and third parties have gained more experience managing energy usage. As of August 2017, the projected net benefits of the project were $94.9 million, including $65.5 million of benefits from delaying load transfers from 2017 to 2026, $549 million of benefits from delayed substation/transmission investments and $133.3 million in benefits from avoided capacity, energy, distribution, environmental and line loss, for a total of $747.8 million of benefits against $652.9 million in costs. The majority of projected costs come from incremental traditional costs in load transfers and substation/transmission investments that have been deferred until 2026. Because of the early success of the program, in July 2017, the New York PSC extended the BQDM program beyond the initial three-year scope with no termination date and without additional funding. Through 2017 Con Edison only spent $69.9 million ($54 million customer side, $15.8 million utility side) on the BQDM program, meaning it has $130.2 million remaining in its budget. More details on non-traditional solutions implemented through 2017 are in the table below. For the most recent figures as of February 2019, see ConEdison's Q4 2018 BQDM Quarterly Report. In January 2019, Con Edison outlined its plan to continue implementation through 2021. The utility plans to continue procurement of additional load reduction above the original 41 MW of non-traditional customer-side electricity demand reduction solutions (projecting 44.5 MW by 2021) and 11 MW of non-traditional utility-side solutions (projecting 18 MW by 2021). Con Edison stated that it will eventually decrease the recovery planned for the program, but for now it plans to use funds remaining from its initial BQDM budget to achieve additional load relief. A daily peak load covering 12 hours, which is longer than has been used in other programs, has presented challenges in using non-traditional solutions such as aggregated DERs to manage peak load over the entire time period. In the capacity-constrained area, 85% of accounts are residential, and most commercial accounts are small. This customer composition has required Con Edison to engage with landlords, tenants and other entities, making the area less easily scalable than would be the case in a service territory with larger customers. The first demand response auction resulted in two-year contracts for demand response resources that were challenging for third-party providers to finance (they usually have 10-year contracts), which led to high bid prices. The BQDM program has learned lessons from these challenges that will not only help Con Edison but also other utilities in future NWA projects. The final results of the program remain to be seen, but the deferment of traditional investments so far has demonstrated that, with adequate incentives, non-traditional solutions can avoid over-investment, save customers money and still give utilities an earnings opportunity. The full case study, "Brooklyn Queens Demand Management Program - Employing Innovative Non-Wire Alternatives," as well as four others, are available for download below. This series is published concurrently with "Navigating Utility Business Model Reform," which provides a menu of options for pursuing reform at the state level. This report is available at: http://www.rmi.org/insight/navigating-utility-business-model-reform.